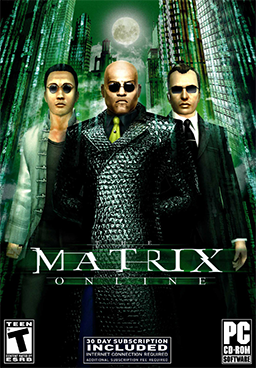 The Matrix Online (also known as Matrix Online) was a massively multiplayer online game developed by Monolith Productions. It was the official continuation of the storyline of the Matrix series of films. The game began closed beta-testing in June 2004 which was then opened for people who pre-ordered the game in November 2004. Warner Bros. and Sega officially released MxO on March 22nd, 2005 in the United States. It was released in Europe on April 15th, 2005. The game ran continuously from then until it was ultimately shut down on July 31st, 2009 by Sony Online Entertainment.